Would you like to add some beauty and artistic style to your yard? 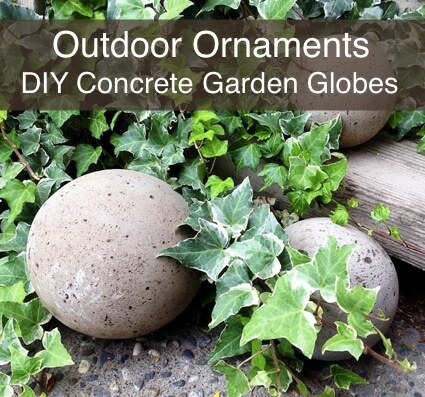 Consider adding a few well-placed concrete garden globes as outdoor ornaments. Often outdoor yard spaces are quite rectangular, and these garden globes help soften and offset that boxy-look. These globes make excellent accent pieces in greenery, in small rock and gravel beds, and on wood and stone surfaces. They help create natural, yet whimsical garden look. These globes are expensive if you can find them in a store. Fortunately, The Garden Glove devoted the time to develop a recipe to make these beautiful globes and to reduce the cost to about $15 for three globes. Read on at the link below for instructions to make these garden ornament spheres.